If you stand for a reason, be prepared to stand alone like a tree, and if you fall on ground, fall like a seed that grows back to fight again. Confidence is the mother of achievement. Confidence is nothing but sheer belief in your abilities or credentials. Confidence is the hallmark of any successful person, who makes it big in life. Confidence drives you to achieve and realize your dreams and ambitions. It makes you feel motivated and inspired. Confidence is one feeling that makes you feel that even the sky is not the limit. 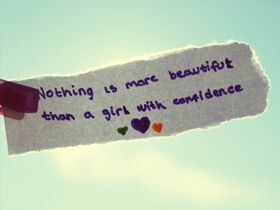 It is extremely vital to be confident about yourself. Confidence makes you positive about your chances of realizing any goal successfully. It is associated with an optimist generally, someone who looks a half-filled glass of water as half full rather than half empty. In the words of Vince Lombardi, "Confidence is contagious and so is lack of confidence." If you stay in the vicinity of confident people, you are likely to be confident yourself. Whereas company of people who lack self-esteem or confidence, can make you feel really low in confidence.